Here is The World of Fluorescent Minerals. The reviews all rave about the book - Great photos, useful information, and written so that it is interesting for the beginner to the advanced collector. The Franklin Mineral Museum and the Sterling Hill Mineral museum sell hundreds of copies each year. 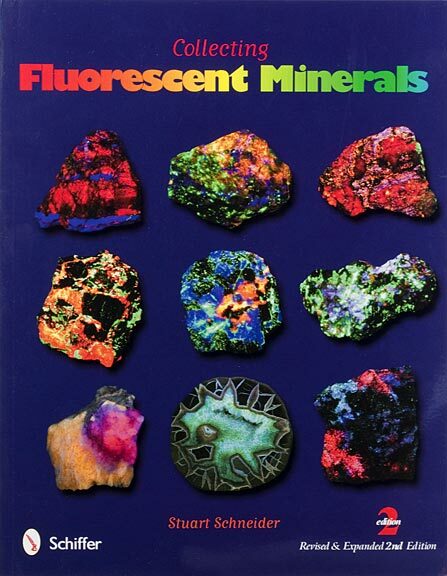 The World of Fluorescent Minerals has 997 beautiful color photos, shows fluorescent minerals from all over the world. You can order one now. The regular price is $29.95, my price is $25.00 plus postage. Customers can use Paypal (my Paypal name is "stuarts1031@ erols.com") or send a check or money order. Shipping is $3.00 on soft cover and $4.00 for hardcover books towards postage (in the United States, overseas is higher). Canada Airmail is $20.00 (soft mailer), Europe Airmail is $29.00 (for softcover books in a hard mailer), Asia & Australia Airmail is $34.00 (for softcover books in a hard mailer). Softcover books can be sent overseas (to most countries) by speedy Global Priority in a soft mailer for $25.00. Overall size is 8.5 by 11.0 inches. Check with me for the postage for the hardcover books. Postal rates keep changing. Share your interest in fluorescent minerals. I would be glad to autograph a copy to your favorite mineral collector. 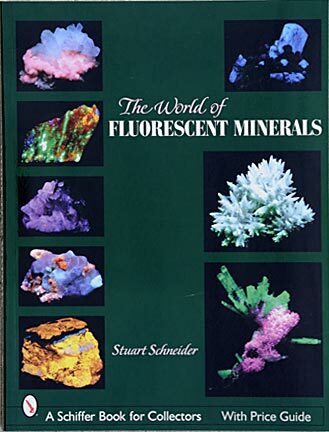 Collecting Fluorescent Minerals is sold out in the 1st edition and now available in a 2nd revised and expanded edition that has 850+ color photos of beautiful fluorescent minerals. It shows minerals from the United States (including New Jersey, Arizona, California, New York, Connecticut, Illinois, and many other states) and beautiful and unusual minerals from Canada, Mexico, Greenland, Italy, Sweden, Afghanistan, China, Pakistan, Russia, and many more countries. There is also a price guide to help beginning collectors get a feel for the current values of these incredible rocks and source and reference sections to help you find mineral dealers, good mineral lights, and other helpful information. The regular price is $29.95, my price is $25.00 plus shipping -Shipping is $3.00 on soft cover and $4.00 for hardcover books towards postage (in the United States, overseas is higher). Canada Airmail is $20.00 (soft mailer), Europe Airmail is $29.00 (for softcover books in a hard mailer), Asia & Australia Airmail is $34.00 (for softcover books in a hard mailer). Softcover books can be sent overseas (to most countries) by speedy Global Priority in a soft mailer for $25.00. Overall size is 8.5 by 11.0 inches. Check with me for the postage for the hardcover books. Postal rates keep changing. (special offer - buy both books and pay only shipping for one - only for shipments to the US since only one book fits into a soft mailer). Customers can use Paypal (my Paypal name is "stuarts1031@erols.com") or send a check or money order. 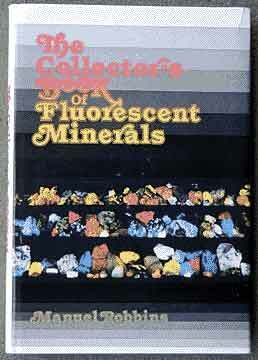 The Collector's Book of Fluorescent Minerals is the first illustrated book on the subject. It came out in 1983 and is by Manuel Robbins. The book originally sold for $45, but now it fetches $175 or more when you can find it (Amazon.com sometimes has it available - latest price was over $300). It is a great-reading book with stories about the miners and the early discovery of the fluorescence in rocks in the Franklin and Sterling Hill mines. An arcing electric spark caused the stones on the sorting table (called the Picking Table) to glow in colors. The miners found that the rocks that glowed green contained zinc while the rocks that glowed red did not. A fellow named Tom Warren obtained a barrel of rocks from the Franklin mine and perfected his company's UV lamps to become portable mineral UV lamps. This improved the mine's ability to find high grade ore and dump the low grade ore. It also helped to introduce the field of collecting fluorescent minerals to many collectors. I really like reading this book. It is not too technical and has loads of information. 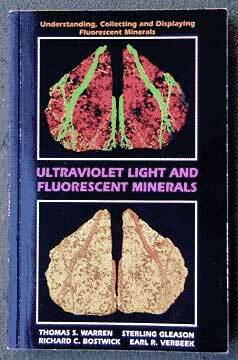 Some of this information is updated and appears in Manny Robbins' second book, Fluorescence, on fluorescent minerals. Above right is Manny's second book, Fluorescence, which came out in 1994. It sold for $49.95, but now appears to be out of print but still fairly easy to find. It corrects some of the errors in the first book, updates the information and is a much more technical read than the first. It is full of good information. It has a small group of photographs. 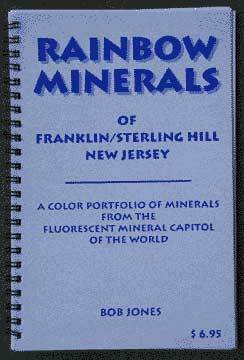 Rainbow Minerals is the best bargain for $6.95 by Bob Jones (printed by Tom Warren). It can be tougher to find, but is sometimes available on eBay. It has a small group of color photos. 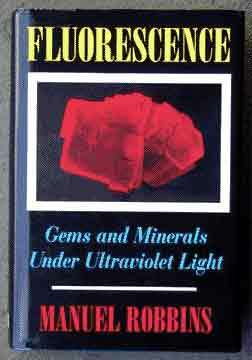 Ultraviolet Light and Fluorescent Minerals is also a pretty good read. It is a good general overview of the subject and nicely covers the field of fluorescent activators. It doesn't have many color photographs. It is written by 4 experts in the field including the late, great Thomas Warren (he passed away in 2001) who invented the portable SW mineral lamp. Another one of my favorite guys is Earl Verbeek. He is friendly and knows his rocks. He is the curator of the Sterling Hill Mining Museum and can identify anything from the area. Richard Bostwick is incredibly knowledgable and is heavily involved in the FMS. When the Franklin mine closed in 1954, over 22,000,000 tons of zinc ore had been removed. The Sterling Hill mine, closed in 1986, produced about 11,000,000 tons of zinc ore over its lifetime. There are about 85 fluorescing minerals that came out of these two mines and surrounding marble quarries. At the Sterling Hill mine, you can take a tour through the upper mine shafts (the lower ones are flooded). Be warned that the temperature is about 54 degrees year round and you may need a jacket to stay warm. A trip through the mine is a real eye opener. You begin to realize that you are under a mountain of solid stone and yet, water is dripping from through the mountain above you. The mountain has loads of cracks and fissures that allow the water to percolate down. This water must be removed during mining by gigantic water pumps that expell thousands of gallons of water a day. Luckily, the Franklin/Sterling Hill mines were composed of non-poisonous minerals (few arsnics, sulfers and other minerals that form acids or poisons when mixed with water). This allowed them to direct all this water into ponds that are below the mines without killing all the wildlife and the people who get their water from wells in the area. Unfortunately, when the mines were no longer profitable, the pumps were not maintained and when they broke down, the water begain to fill the mines. The cost to pump all this water out again is prohibitive and the current owners have no intention of spending millions of dollars to reopen the mines lower levels to tourists. Collectors of fluorescent minerals can still go to the mines and for a fee - currently $5.00 entry plus $1.50 per pound of material you take home - prospect on the mine dumps (bring your UV lamp and a blanket to cover your head for daylight digs. Nighttime digs are also held for mineral society groups). The dumps are composed of material that was removed from the mine and dumped in areas adjoining the mine site. After years of mining, the waste material was no longer hauled out of the mine (an expensive process). It was just moved sideways and used to fill in shafts that were mined out. The waste was dumped in adjoining shafts which are now under water. What treasures they must hold. One of the above ground dumps, the famed Parker shaft, was prospected for years (esperite, margarosanite, prehnite, etc.) until a new firehouse was built on the site and the whole area was paved over for a nice large parking lot ("We don't need no historical memories" the town council must have said). We, who haunt the dumps, live in eternal hope of finding some great old material. Activators: The reason that most of these minerals fluoresce under UV light is that some "impurity" has invaded the rock during its creation. Two major exceptions are tungsten's source mineral scheelite that fluoresces without any activators and uranium-type minerals, which glow (usually green) with variable degrees of radioactivity. The most common activator here is manganese. It is responsible for the glow of many of the Franklin/Sterling Hill minerals. The study of activators is technical and without a laboratory to assay your minerals, you will just have to rely upon what the books tell you. A bit of trivia: Did you know that color television is a direct result of fluorescent minerals. Scientists studying ways to make a color television turned to fluorescent minerals and investigated what made the minerals fluoresce in the different colors. They produced man-made fluorescent materials that could reproduce certain colors repeatedly and accurately. The materials were applied to television screens and when activated by the phosphor gun in the picture tube, the different colors appeared on the face of the screen. The Fluorescent Mineral Society. This is a great organization that publishes newsletters and links you with a group of people who will not laugh when you tell them you collect glowing rocks. fluorescent mineral database for the enjoyment of FL mineral collectors around the world"
The Alkali-Nuts. The Mt. St. Hilaire, Canada Fluorescent Mineral Group. Polman Minerals. A dealer in fluorescent minerals. Christian Thorsten's informative site with a great section on "NJ Disappearing Sites" and the "FROG online archive". MinResCo. A resource for minerals, lights, supplies, etc. The Miner Shop. A source for buying fluorescent minerals from Greenland. Soenke Stolze's fluorescent minerals for sale (German dealer). Books #3 on Flashlights, Picture Frames & Halley's Comet | Ghosts In The Cemetery| Waffle Recipies| Links Copyright 2011 through 2019 by Stuart Schneider. Do not use any parts of these pages without written permission.